I've been thinking a lot about why we're doing the type of work we've been doing over the past couple of years, manifesting alternative futures in the form of immersive experiences and tangible artifacts (postcards, products, props). This question is central to my doctoral dissertation topic that's been gestating throughout the semester, but I find it hard to write about -- there's a tangle of related ideas that don't seem to want to let go of each other, so pulling at one thread seems to disturb the whole clump. There are three points I want to make, and I'll spread them over several posts. 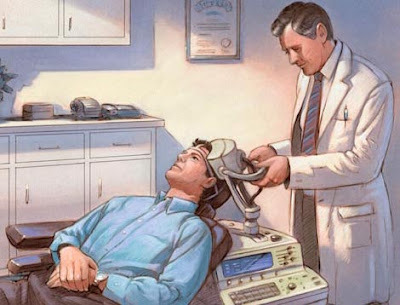 First I want to say something about the concept of future shock and how it gives rise to the idea of future-shock therapy. Next I'll talk about the "therapy" aspect of it, the immersive or experiential role of arts and design in this effort. Finally, we'll examine the relationship between scenarios, simulations, and hoaxes. Culture shock is the effect that immersion in a strange culture has on the unprepared visitor. It is what happens when all the familiar psychological cues that help an individual to function in society are suddenly withdrawn and replaced by new ones that are strange or incomprehensible. Yet culture shock is relatively mild in comparison with a much more serious malady that might be called "future shock." Future shock is the dizzying disorientation brought on by the premature arrival of the future. It may well be the most important disease of tomorrow. Future shock is a time phenomenon, a product of the greatly accelerated rate of change in society. It arises from the super-imposition of a new culture on an old one. It is culture shock in one's own society. This is the prospect that man now faces as a consequence of accelerated change -- the prospect of dislocation far more subtle, complex, and continuous than any we have known. Change is avalanching down upon our heads and most people are utterly unprepared to cope with it. The commanding point is that we can anticipate volcanic dislocations, twists and reversals, not merely in our social structure, but also in our hierarchy of values and in the way individuals perceive and conceive reality. Such massive changes, coming with increasing velocity, will disorient, bewilder, and crush many people. We think of ourselves as sophisticated and well educated, but how well prepared are we, as a society, to cope with the sudden new sensations, pains, intellectual turnabouts, eruptions, and shifts in perception that are likely to confront us as we speed forward into a culture in which computers can learn, and can improve upon their own performance, in which man is no longer the only manifestation of high-level intelligence on the face of the earth, and in which, in fact, he may come crash up against the realization that his globe is not the only inhabited parcel of real estate in the universe? For the current upbringing of most people, and the subtly inculcated sense of time that comes with it, are both inimical to adaptability. The fact is -- and simple observation of one's own friends and associates will confirm it -- that even the most educated people today operate on the assumption that society is relatively static. At best they attempt to plan by making simple straight-line projections of present-day trends. The result is unreadiness to meet the future when it arrives. In short, future shock. What, if anything, can be done to lessen this shock and the disorientation and disability that come with it? Society has many built-in time spanners that help to link the present generation with the past. No such time spanners enhance our sense of the future. We have no objects, no friends, no relatives, no works of art, no music or literature, that originate in the future. We have, as it were, no heritage of the future. Despite this, there are ways to send the human mind arching forward as well as backward. We need to begin by creating a stronger future-consciousness on the part of the public, and not just by means of Buck Rogers comic strips and articles about the marvels of space travel or medical research. These make a contribution, but what is needed is a concentrated focus on the social and personal implications of the future, not merely on its technological characteristics. We offer our children courses in history; why not also make a course in "Future" a prerequisite for every student, a course in which the possibilities and probabilities of the future are systematically explored, exactly as we now explore the social system of the Romans or the rise of the feudal manor? We train our Peace Corps volunteers by attempting to give them advance knowledge about the conditions and culture of the country to which they are assigned. Why not devise an education designed to minimize future shock? The emergence of the academic field of futures studies during the second half of the twentieth century can be seen as a response to this challenge. It is exactly what Toffler calls for --- an attempt to devise an education designed to minimise future shock. But it has, I think, failed to have the mainstream impact that it should have. As regular readers of this blog will be aware, like other futurists I frequently find myself in conversations with people who have never heard of futures, are incredulous that it exists (because of their assumptions about what it entails), and who accordingly think there is something wrong with me because I study it. (This misunderstanding occurs with monotonous regularity in the press, too, most recently in this abysmally lazy piece in The Economist -- among the suitably appalled futurist responses so far: Michele Bowman, Jamais Cascio, and Maree Conway). Even if we're doing good work, the what-futures-is-not conversation that ensues in nine out of ten first meetings with anyone of even moderate intellectual curiosity suggests strongly to me that the formal study of futures is not having the impact it should be having on popular discourse about "the future". We must kill, once and for all, the popular myth that the future is "unknowable." Every day brings improvement in man's ability to peer into the darkness ahead, and this is true in the social as well as the "hard" sciences. [W]e might consider creating a great national or international institute staffed with top-caliber men and women from all the sciences and social sciences, the purpose of which would be to collect and systematically integrate the predictive reports that are generated by scholars and imaginative thinkers in all the intellectual disciplines all over the world. Of course, those working in such an institute would know that they could never create a single, static diagram of the future. Instead, the product of their effort would be a constantly changing geography of the future, a continually recreated overarching image based on the best predictive work available. Our notion of future-shock therapy takes seriously the challenge of anticipatory, immersive experience -- educating to mitigate future shock, as it were. But it's integrated with the plurality of alternative scenarios which we believe to be essential; faithful to the radical contingency and unpredictability which increasingly mark the accelerating historical process. In contrast to Toffler's advocacy of a probabilistic single best-guess, our prescription for future shock involves entertaining a multiplicity of images of the future, based on differing emphases, interpretations, aspirations, and concerns -- each with their own logic and legitimacy. During the Bird Cage installation for FoundFutures:Chinatown, we ran into some difficulty finding a property owner willing to have our bird flu memorial plaque mounted on their building. After the controversial reception of McChinatown, one party who had agreed earlier changed her mind, citing concerns about the impact that being associated with even a hypothetical disease could have on business. Shortly before our deadline, we were referred to Oren Schlieman, a local graphic designer and owner of the company Info Grafik. Not only was Oren highly encouraging, but he saved the day by allowing us to install the plaque on his Chinatown building (as seen here). 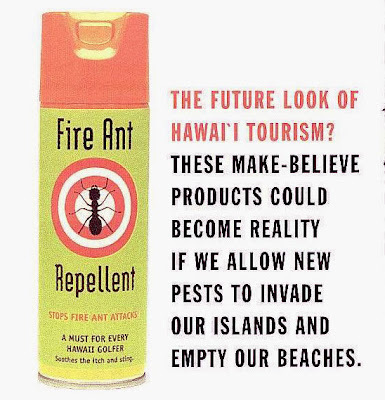 He also noted that the "artifacts from the future" and hypothetical products design memes, though increasingly visible as the decade wears on, have been around a while. 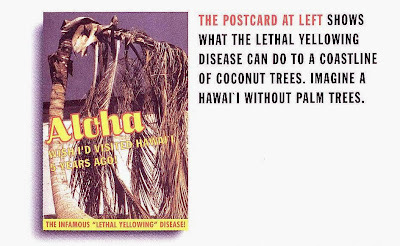 So saying, he referred to a public awareness campaign for Hawaii's CGAPS (Coordinating Group on Alien Pest Species) produced by Info Grafik a decade ago, employing a similar approach. CGAPS was created in 01995 (as explained in this pdf), and its public awareness effort, Silent Invasion, launched two years later (love those old time websites!). 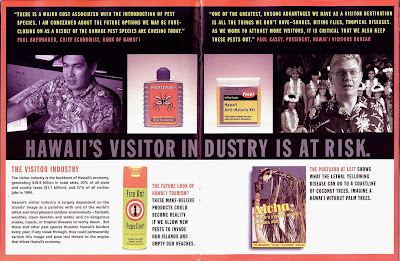 The images below are scanned from the print version of that campaign. 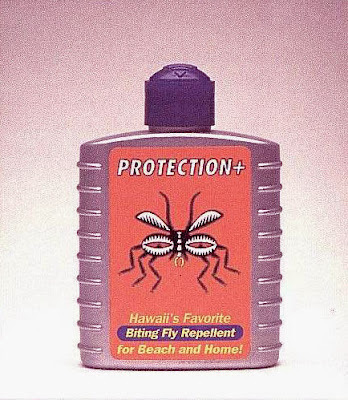 The legislature finds that the silent invasion of Hawaii by insects, disease-bearing organisms, snakes, weeds, and other pests is the single greatest threat to Hawaii's economy and natural environment and to the health and lifestyle of Hawaii's people. So what's the role of these quasi-futures artifacts in all this? ...very similar to the Sierra Nevada mountains campaign blogged here earlier. 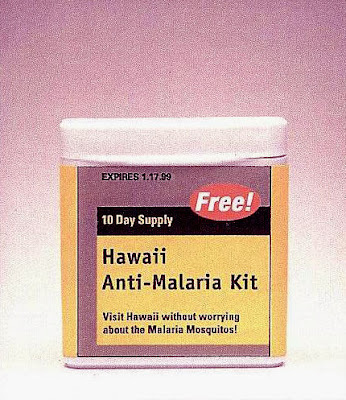 Now, a few weeks ago the President of the Hawaii chapter of the Sierra Club, Jeff Mikulina, presented a seminar at the East-West Center (sponsors of my doctoral studies here at the University of Hawai'i). Jeff has been trained by Al Gore to give the Inconvenient Truth presentation on climate change, but one of the additions he made was to point out that risks which tend to receive attention are "soon, salient, and certain" (quoting Helen Ingram, a University of California-Irvine professor of planning, policy and design.) The point was that difficulty meeting these criteria (and hence motivating an appropriate response) is inherent in the nature of climate change -- a slow, distributed and ambiguous process, albeit one with massive risk implications. We can surmise that the human brain developed risk management criteria along the lines Ingram suggests as a sort of prioritisation heuristic. Clearly, though, that filter might not serve us so well in facing less visible/immediate, and more distributed/long-term risks. So it seems to me that one of the functions of monitory artifacts (and images of artifacts) from the future, such as the above, is to assert a claim on our attention that cuts the mustard on Ingram's scale. By manifesting a feared future now, tangibly or visually, we are forced to take account of a risk that might otherwise be dismissed as remote, irrelevant, or improbable. Like invasive species. Or bird flu. Or earthquakes. The Arts at Marks Garage exhibition, Alternative Urban Futures, remains open through the end of this week. 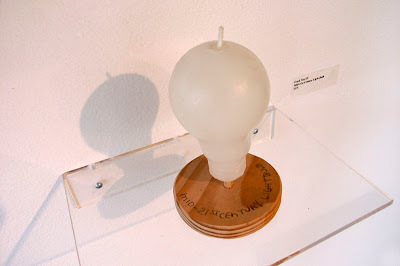 Above is a photo of my favourite piece: "Mid-21st Century Light Bulb", an elegantly simple, pointedly insightful artifact from the future, by sculptor Frank Sheriff. An effective futures artifact, like a good scenario, need not be a literal forecast made in earnest. Symbolism and satire work fine too. Tomorrow, Thursday 15 November 6-7pm, the gallery has scheduled an artists' talk, when those featured in the show will have a chance to explain themselves, answer questions, and that kind of thing. Jake and I will have an opportunity to say a word or two about the FoundFutures artifacts on display. This Saturday 17th, wearing our futures researcher hats, HRCFS is running a Chinatown Futures Workshop at the gallery, intended to help residents, business owners and other interested parties to think more deeply about possible paths for the district over the next generation or so. The workshop is free to the public, and runs 12 noon to 4pm. Please RSVP to info at foundfutures dot com if you plan to attend. The Arts at Marks Garage is located in Honolulu's Chinatown, 1159 Nuuanu Avenue, at the Pauahi Street intersection.